It has been a long time coming, but finally it happened: OpenOffice.org has been forked under the name of LibreOffice. The Document Foundation will oversee the development of LibreOffice. According to the press release, "The Document Foundation is the result of a collective effort by leading independent members of the former OpenOffice.org community, including several project leads and key members of the Community Council." Red Hat, Canonical, Google, and Novell are among the backers of The Document Foundation and the new fork. The idea of creating an OpenOffice.org fork and creating an independent foundation is not new and it has been discussed several times by the OpenOffice.org community and developers outside Sun Microsystems, the previous steward of the OpenOffice.org project. Sun has been often criticized for the way it managed the project. But apparently the hassle of forking OpenOffice.org outweighed the benefits of such move. The acquisition of Sun by Oracle changed the situation. Despite the criticism, Sun was widely perceived as an open source-friendly company. Oracle has no open source cred to speak of, and the database giant remained vague about its plans for OpenOffice.org. So the decision to fork OpenOffice.org under the umbrella of The Document Foundation comes as no surprise. The good news is that the new initiative doesn't have to start from scratch. The Go-oo project ( a de facto fork of OpenOffice.org maintained by Novell) has laid down the foundation for the fork. Moreover, The Document Foundation is backed by heavy-weights of the open source world like Red Hat and Canonical, which ensures that the new project won't die on the vine. However, creating a fork means that the new project has to find and establish its own identity and position itself as a viable alternative to Oracle's OpenOffice.org. There are other challenges, too. Similar to OpenOffice.org, LibreOffice relies heavily on Java, and as such it remains vulnerable to potential legal attacks from Oracle which now owns the Java technology. Microsoft was also claiming at some point that OpenOffice.org violated several of the company's patents, and it may deem today's announcement a good opportunity to launch a legal offensive against LibreOffice. All in all, the new-born productivity suite may face a few serious challenges, but its birth is welcome news to all users and developers unhappy with how Sun and Oracle have managed the project. 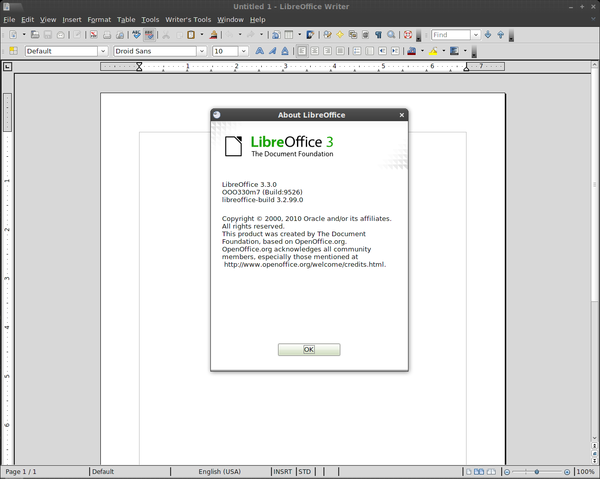 A beta version of LibreOffice is available for download at the LibreOffice Web site. The current release is basically a rebranded version of Go-oo. For now, only RPM binaries are available for both the 32-bit and 64-bit architectures. According to the press release: "Oracle Corporation -- who acquired OpenOffice.org assets as a result of its acquisition of Sun Microsystems -- has been warmly invited to become a contributor to the new Foundation." And the availability to export to pdf in openoffice. The fact that Oracle is accusing everyone of misusing Java is doing harm to Java programmers. One good thing about Java is its portability. OpenOffice needs Java to reduce the amount of work when developing for the many OS. Besides, the many Java developers out there contribute voluntarily to extensions, etc. For those who might not know, (including the previous posters on the subject,) the Open Office 'build' process is entirely dependant on Java. It's possible, and actually easy, to build Open Office from source and make the package available for others to download and install without Java, Java is still required by the developers and packages who prepare that download. There was momentum a few years ago to liberate Open Office from Java dependency, but that project stalled when Sun announced (and for the most part, delivered) Java under a GPL license. However, I expect this work might get more focus now that Oracle has demonstrated their willingness to wield Java patents against projects/companies they feel they can extort money from. The post says "Similar to OpenOffice.org, LibreOffice relies heavily on Java". In what sense does OpenOffice *rely* on Java? Or relies on it heavily? As far as I know, OpenOffice does not rely on Java at all. There are a couple of features which can use Java, but most users will never use them, and will never need Java. At last! May it happen to other softwares as well. Hope they can improve performance. When scrolling pages with graphics and text pasted in from websites openoffice.org writer totally slows down, freezes up, and sometimes freezes the desktop. If they can build a big team, it will be a success. Note that the codebase is very complicated so you can't just hire people off the street to jump in. It takes years to achieve mastery of such a codebase. So they should try to hire or have the existing Sun / Oracle employees mentor the new people. If that is true, they should adopt SQLite instead and be done with Java altogether. I'm delighted! And since Canonical is an open supporter, I hope to be able to enjoy Libre Office in the Narwhal. It would *have* to be. Java is what could provide Oracle with a means of killing LibreOffice and saying "we are the only ones who can control this project". Why? Patents. It'd be very naive to think Oracle wouldn't attempt such a strategy. LibreOffice relies heavily on Java: There's not *that* much java in there (http://wiki.services.openof.../wiki/Java_and_OpenOffice.org). From my perspective the only really significant thing is that the default simple database backend is hsqldb which happens to be Java, in a pinch that could be replaced relatively easy.